It was a good news/bad news week for the Philadelphia Eagles, but the bad news side of things has threatened to take over their season. The Eagles came back against the Los Angeles Rams on the road and snatched a win on the second-leg of their two-game West Coast swing, righting the ship after a defeat the week prior at the hands of the Seattle Seahawks. That kept them in possession of the No. 1 seed in the NFC, and perhaps more importantly, showed that they could handle that kind of gut-check and impress against legitimate opposition in disadvantageous circumstances. The bad news though was that it looks to have cost them their quarterback, Carson Wentz, to a knee injury for the remainder of the season. Wentz had his knee buckle slightly as he left the field, and he was very quickly ruled out by the Eagles medical staff. Reports are that the team fears a torn ACL, and tests Monday are expected to confirm that he will be out for the year with that injury, turning over the reins to Nick Foles to steer the ship in his absence. Foles has three seasons of incomplete starting experience, first with the Eagles and then with the Rams before he made his return to Philadelphia, but all of that time was under different coaching staffs. Coming in cold off the bench on Sunday, he completed 6-of-10 pass attempts for 42 yards, with two of his incompletions on plays in which he was hit as he threw. Despite taking less time on average to get the ball out of his hands, Foles was under pressure five times out of 12 dropbacks. Losing Wentz is obviously a huge blow to a Super Bowl contender. He’s currently the fourth-ranked quarterback overall at PFF with a grade of 87.2, and was getting MVP buzz around the NFL. The silver lining for the Eagles – if there is one – is that we have talked this season about how good a coaching job the team has done to position Wentz to succeed. 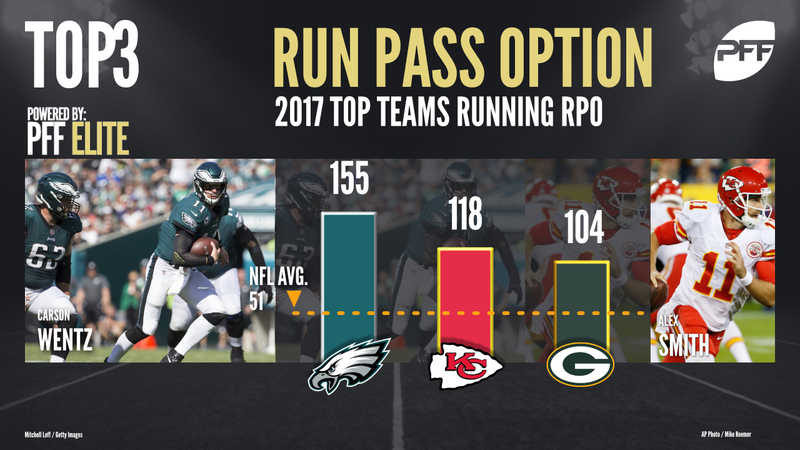 The Eagles lead the league in the use of run/pass options (RPOs), with 155 this season, 37 more than any other team. Only two other teams have run more than 100 RPOs this year, and there are teams in the single digits. These plays can be incredibly effective for an offense, because they force a defense to defend multiple facets at the same time, while simplifying the reads for the quarterback and giving him the option to make them wrong whatever they do. Foles’ best season came back in 2013 under Chip Kelly in an offense that used a lot of RPOs and schemed to help his play. His PFF grade was 80.9 overall, and 81.8 as a passer, but his passer rating that year was a monstrous 117.9. 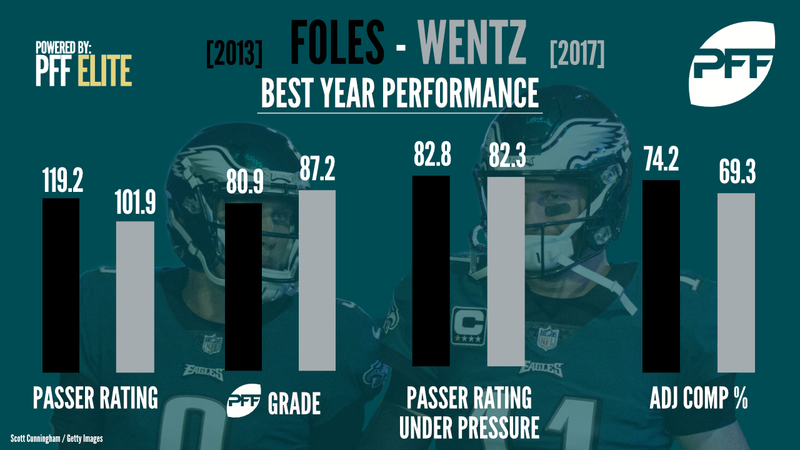 That disconnect between passer rating and PFF grade is actually good news for the Eagles, because it shows that Foles has a history of being productive in the right system without actually playing fantastic football to get it. The Eagles that season were able to scheme him a lot of open looks and easier throws to inflate his stats and production, without asking too much of him. As that offense struggled the next season and more was asked of him in a conventional (and arguably dated) NFL offense with the Rams, his production and grade took a nose dive. The key point though, is that he is back in a system and scheme that has been bolstering its quarterback already. Foles doesn’t need to match the athleticism of Wentz to be effective in an offense that runs a lot of RPOs, he just needs to be able to execute a couple of simple reads reliably and take advantage of the openings that those plays create. If you compare Foles in 2013 to Wentz this season, the numbers make for interesting reading. Foles was more accurate and had a better passer rating, but that was largely due to the low number of interceptions he threw, which owed something to luck. Foles had just two interceptions across 361 pass attempts, but he had four times that many turnover worthy plays. He was just as effective as Wentz has been when under pressure – a key aspect of play as the Eagles already have to contend with losing LT Jason Peters for the season. 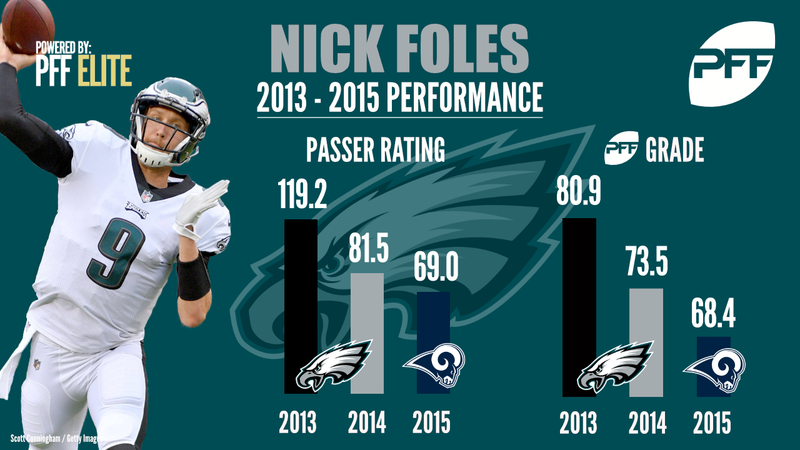 This is obviously far from a guarantee, and there is plenty of disastrous tape on Nick Foles outside of that 2013 season, but the Eagles offense that year shares some notable traits with the 2017 version. Even despite the differences in coaching staff, it could signal the potential that the season is far from lost with Foles at the helm. This Eagles defense has arguably the best defensive front in the game, a secondary getting healthier, and a run game that has been built to be deep and productive at key times. Wentz was the glue holding it all together, but he has been put in fantastic position to succeed by the scheme this season. That same scheme should work to the strengths of Foles as well, and so the drop off from Wentz to his backup may not be as precipitous as Eagles’ fans fear.